Nicola Singh’s installation, Sweet Spot (2017), teases the viewer with the potential for action, initially appearing as a static, completed artwork, yet there are signs throughout that there is something more. This is a work that rewards patience, revealing more of itself with careful consideration of the possibilities held within. While the room is filled by the central fabric pieces, forming the key visual component, the audio and performative props, placed at various points around the edge of the room, tell us that this is more than just a static work of art to be viewed. This is a site for action and performance. As such, seeing the work in this gallery environment creates a tension, giving the feeling of waiting for something to happen. 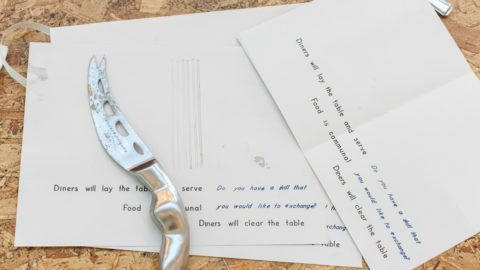 This was particularly prevalent at the beginning of the exhibition, where viewers were between happenings, as Singh had completed the performative process of creating the work, but was yet to activate the finished installation with her follow-up performance. The work played coy with the viewer, hinting at the process of production as well as the possibility that there was more to come. 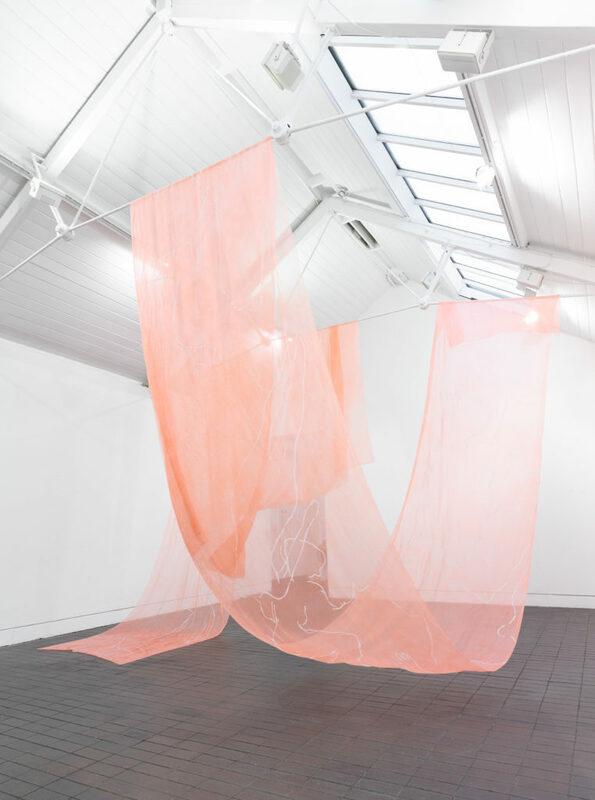 Two semi-translucent pieces of pink fabric drape down from the ceiling, painted with semi-abstracted human forms, while upon the walls are ‘performative props’ placed by Singh, looking like gym or playground equipment, expectant of action. This visual experience is initially scored by Singh’s first audio piece, as she talks through parts of her body, detailing the physical experience of inhabiting it. This first incarnation of the work – prior to the performance that would activate the space and provide a new audio component – is a contemplative space. The audio and visuals encourage the viewer to consider their own body, which are broken down into its various component parts, such as when Singh’s voice talks through details such as ‘the weight of my hair’. 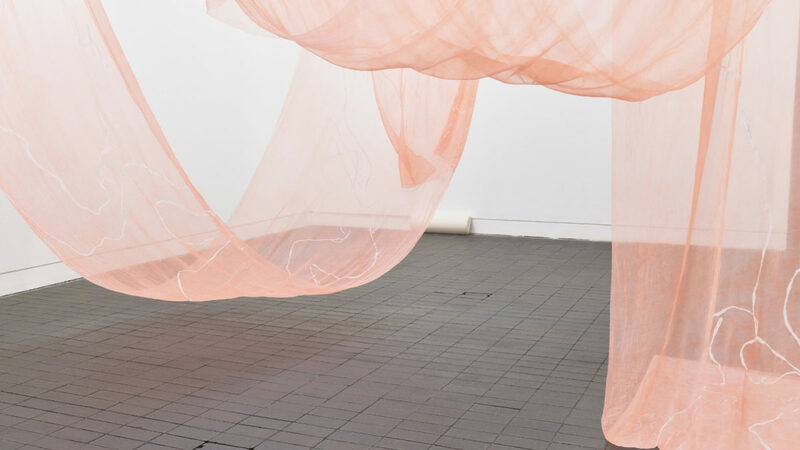 To initially develop this installation, Singh worked with fellow artists Deborah Bower, Tess Denman-Cleaver, Naomi Garriock and Kate Sweeney during the initial collaborative research stage of the project. 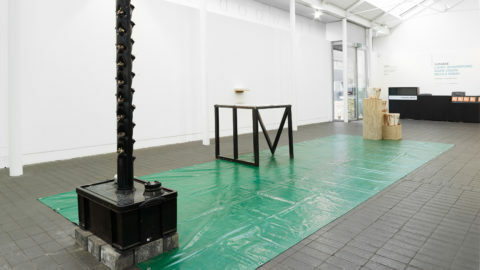 With this model of working, Singh has developed a unique approach to collaboration and individual artistic practice, as the collaborative element, in this instance, forms the research element of the project, before Singh individually authors the final installation. Working with Bower, Denman-Cleaver, Garriock and Sweeney, Singh produced the script that would become the initial audio component, considering the human form with a method developed from the Skinner Releasing Technique. Developed by choreographer Joan Skinner, the Skinner Releasing Technique allows participants to form new possibilities for movement which allows them to truly relax and consider the possibilities of what the body can do. Singh reacts to and builds on this, forming her own method for understanding and articulating details of the body that aren’t typically considered, such as the aforementioned weight of hair. Along with this, the bodily forms depicted across the fabric read as attempts at coming to a visual understanding of the human form. As with the audio, these visuals were initiated as part of Singh’s research stage, where she asked her collaborators to draw outlines of their own bodies, a deceptively complex task that requires intimate negotiation of the body to try to capture it while using it. The finished visuals, formalised and applied by Singh, become sketchy, rough shapes, divergent from traditionally representative depictions of the human form. As applied to the fabric they exist effortlessly, in a vaguely ethereal state, suspended in the air, ghostly apparitions of human form that are not quite real. 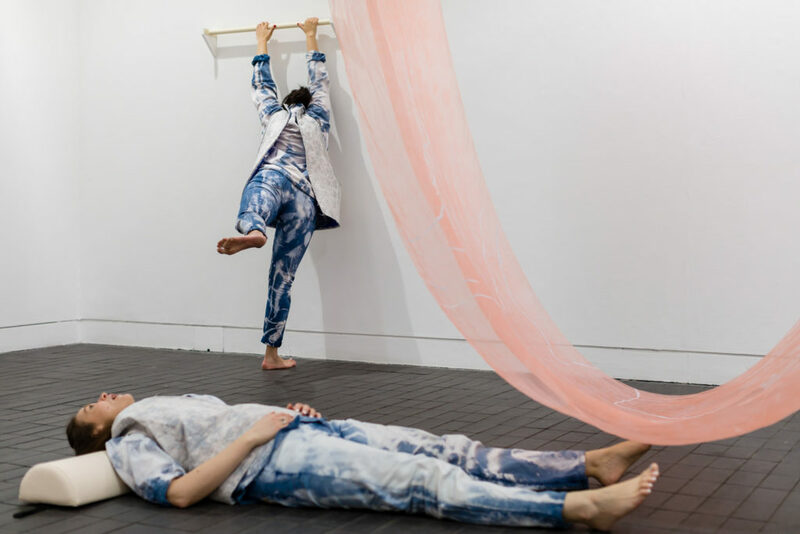 Now, following Singh’s performance within the space alongside artists Jenny Moore and Harriet Plewis, the audio has changed and the work has fulfilled the initial potential for action implied at the earlier stage. Once again, the audio concerns the body, but in a more lyrical, abstract manner than previously, as the performers improvise and seemingly enjoy themselves while in the act of semi-spontaneous creation. The loose structure of the new audio is a result of Singh’s desire for real, rather than rehearsed, reactions during the performance. Singh’s desire was for the three performers to be themselves rather than play the part of the performer, avoiding any sort of stage personality in order to encourage true reactions to one another. This plays out in a number of simple yet notable ways, such as laughter from two performers as the other does something funny. The three establish a natural feeling rhythm together, able to react and build on one another’s actions. Throughout, what seem like improvisations become expanded and built into the performance, becoming recurring motifs. Sweet Spot, in line with this element of ongoing development that appears to be part of Singh’s practice, initially hints at potential action before going on to deliver on said potential. It will be interesting to note how she continues, changes and adapts as the exhibition itself develops. The move through the three different venues, each with very different spaces, will ask questions of all three artists, but as Singh’s work is much more tied to the space itself and physical action within that space, it is perhaps most relevant to her, and seeing this develop should prove an interesting process.